Luciano Carranza has worked at El Aguila for 50 years. He is 80 years old! After the cherries get pulped and fermented, it gets washed and dried on patios in the sun for 16 days. Balanced and fruity with caramel sweetness, blackcurrant and winey acidity. Soft mouthfeel with notes of plum, dark chocolate and yellow peach. Finca El Aguila (‘the Eagle’) is located at 1500m – 1720 above sea level nestled between the La Ranas and El Aguila volcanoes near the town of Cantón Ojo de Agua, a municipality of Chalchuapa in the Santa Ana department of El Salvador. 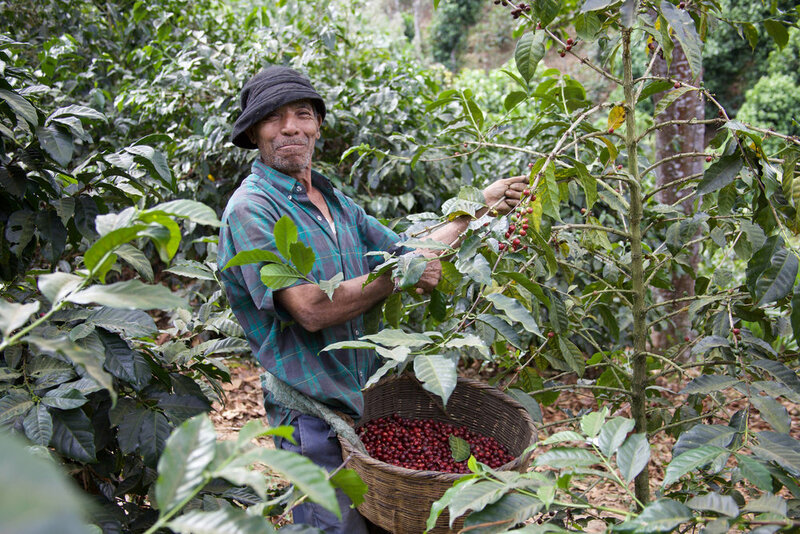 The farm 63 hectares in size, 44 of which are planted with coffee with the rest dedicated to a natural reserve. It has the perfect conditions to produce exceptional coffee, with high altitude, rich volcanic soil, plenty of rainfall and temperatures of 18 – 24 degrees Celsius. Today, the farm is run by the fifth generation coffee farmer, Ricardo Ariz. Ricardo only recently took over the farm and is relatively new to coffee. He has fond memories of being at El Aguila from an early age with his grandfather, Miguel Angelo, a passionate and curious farmer. Ricardo’s grandfather passed away in the late 60s, and Mauricio, Ricardo’s father, took over the farm. He was very young at the time, having just finished college. Mauricio managed the farm for 15 years until 1980. At this time the Civil War erupted in El Salvador, and the country saw extreme violence for next 12 years. During ‘The Lost Decade’, the farm was practically abandoned. Mauricio and his family moved to the States, and the farm was managed at arm's length via engineers who visited the farm 4-5 times a year. In the 1990s, when the Civil war ended, the Ariz family started to recoup the farm and hired people to manage the farm on a daily basis. However, the farm's remoteness and inaccessibility made this difficult. It was not until 2010, after the passing of Ricardo’s 88-year-old grandmother, that the family decided to actively invest and manage the property. It was at this time that Mauricio (who had built up a successful business in the US and had no intention of returning to El Salvador) approached Ricardo to run the farm. Ricardo, who has a Masters in Economics and Finance had spent most of his adult life in venture capital. Since taking over the management of El Aguila, Ricardo has surrounded himself with a strong team of experts who have helped him ensure that they engage with the best possible farming practices on the farm. He now has a team of 7 full-time employees, including a full-time agronomist. He also employs 60 pickers during the harvest. In addition to employing local community members on the farm, the Ariz family also supports the Ojo de Agua community with workers and materials to maintain two access roads, as well as providing a water supply to the community from their water reservoirs. Hopefully, in the future, they will be able to facilitate access to electricity for this community as well. Ricardo’s staff have helped him build an inventory of what is growing on the farm. In total, they have discovered 7 unique varieties which have been gradually separated and tested for both cup quality, resilience and yield. Of the 7 they have found 3 that are commercially viable – (I.e. they cup well and produce enough coffee). In addition to these varieties, the plantation has mainly Bourbon planted throughout it (around 80% of the plantation), and some small plots of SL28, SL34, Pacamara, Yellow Caturra and Geisha. Ricardo and his team are now working out the best places of the farm to plant each variety so that it thrives. Annually, Ricardo and his team plant around 8500 trees per year. Trial and error have seen them gradually find the optimal places to grow each variety and armed with this knowledge, Ricardo is gradually mapping out a long term plan for the farm. Planting new varieties has become a priority, especially those that appear to be unique to the farm. Ricardo admits that the quality of El Aguila’s cup is largely due to the unique microclimate of the farm. Ingas and Copalchi trees have been planted to provide share and protect the coffee trees from direct harsh sunlight during the peak of the harvest. Fertilisation is only performed after careful soil analysis by the farm's agronomist, and weed control is performed manually to avoid the use of herbicides. Other practices on the farm include erosion control using vegetative barriers, and the composting of pruned branches to create more organic matter for the farm. This particular lot purchased from Ricardo is 100% Bourbon. It was carefully handpicked under the supervision of the farm’s manager, Antonio, who ensured only the very ripest cherries were selected. It was then delivered to the mill at El Carmen, where it was pulped and fermented for 18 hours and then washed and dried on patios in the sun for 16 days.